Remember that seen from Ghost, where Whoopi Goldberg’s character informs Molly (played by Demi Moore) that she’s in danger? 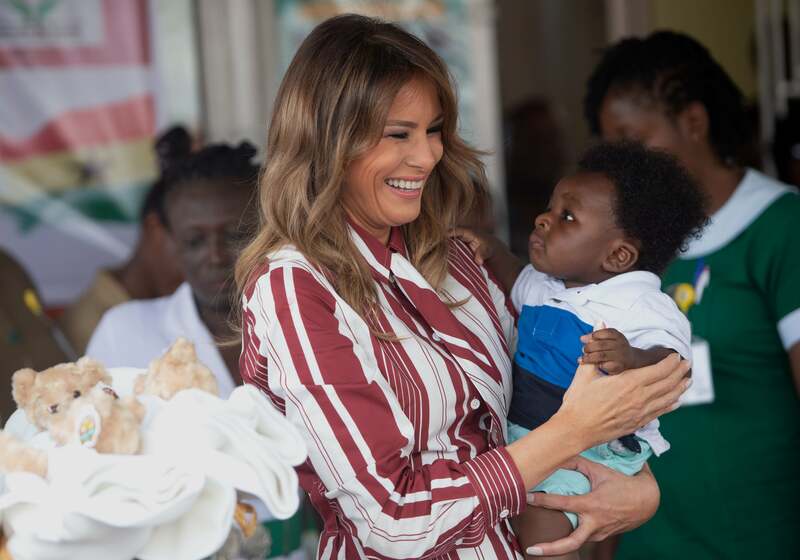 Well, Melania Trump’s solo trip to Africa (which is a continent and not a country) kicked off on Tuesday morning, and as you can see from the pic, even the babies are giving her side-eyes. Trump’s tour will take her to Kenya, Malawi and Egypt, where she will focus on promoting health and education. One hopes that she tries to refrain from referring to the countries as a “sh-thole,” like her husband so infamously did in February. According to ABC News, Trump was greeted by Ghana’s first lady, Rebecca Akufo-Addo and exchanged gifts that included kente cloth and a signed White House leather case. Trump also toured a baby clinic, where the baby in the above photo hit her its illustrious side-eye. Stephanie Grisham, the first lady’s spokeswoman, spoke about Trump’s visit on Tuesday, “Africa remains a priority for this administration and I believe the first lady’s trip through the continent will showcase just that,” she said.